The Good Spurs do still exist! The Good Spurs are back, y’all! At least for one night. 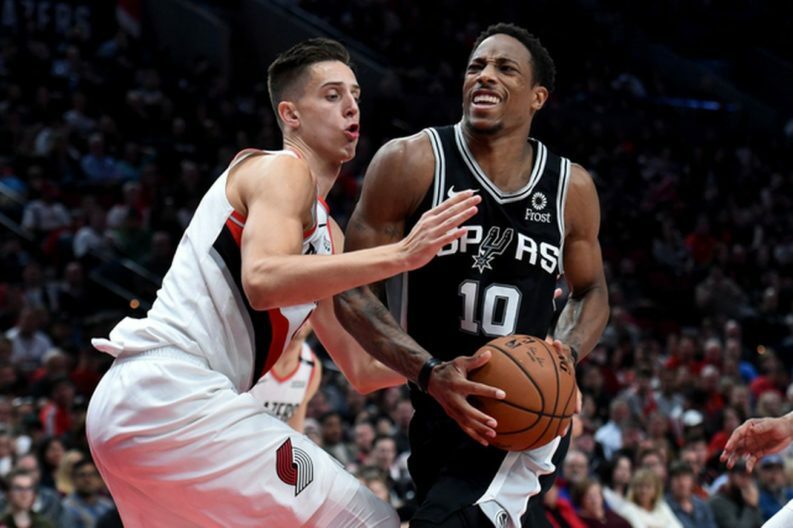 In a battle between two conference rivals who have both lost their way after strong starts, the Spurs came out determined to make a statement against the Trail Blazers following back-to-back blowout losses. In a back-and-fourth, physical, and exciting game, the good guys came out on top thanks to an amazing shooting night as they hit over 60% from the field (50-83), including 11-15 from three. DeMar DeRozan led the Spurs with 36 points, 8 rebounds, and 6 assists, while LaMarcus Aldridge dropped in 27 against his old club. For the Blazers, Damian Lillard scored 37 points, and CJ McCollum put in a relatively quiet 24 points. Coming into tonight’s game, the Spurs had a winning record against every team in the league — the only club that can claim such a feat. With just an 84-83 edge over Portland, the Blazers stood a decent chance of getting themselves off that list, but it didn’t happen. Aldridge and Jusuf Nurkic had quite the physical match-up going. Aldridge eventually realized he was better off either facing Nurkic straight up or driving directly at him rather than trying to back the much bigger Bosnian down or shooting fade-aways over him, and it paid off. Maybe Pop needs to hire Jesus Gomez. He said Davis Bertans needed to start. He did, and he also got plenty of minutes with the bench with Marco Belinelli out with a sore neck. He was an energizer to both units, and coincidentally or not the ball moved better for the starters tonight. He scored 10 points on 4-7 shooting in 27 minutes on the night. Pop seemed to put more of an effort into staggering the starters and bench, which created some more well-rounded line-ups that didn’t have glaring weaknesses. The league must have told the refs to watch for carrying/palming the ball more often. They called it three times in the first half alone, each being something you see pretty frequently every game. Derrick White is still finding himself out there, but he’s looking better with each passing game, especially as a distributor. He has a very Manu-esque ability to find seemingly impossible passes on the drive, sometimes to the point the he gives up a decent chance at a lay-up for a more open player. He still found his own shots as well, and finished the night with 10 points, 5 rebounds and 6 assists, plus some solid defense. Some random role player always seems to have a big game against the Spurs, and tonight it was Al-Farouq Aminu. He had the hot hand coming out of halftime and frequently took advantage when the Spurs helped off him to double-team. He hit three-threes to help the Blazers open the third quarter on a 24-10 run as part of a season-high 20 points. Unlike previous games, the Spurs responded to that run by riding a red-hot DeMar DeRozan, who following a rough first half had 17 points in the last five minutes of the third quarter. He was pretty fired up in large part because he felt slighted by the refs. (Pop appeared to agree, often arguing his case for him.) Once he started taking that anger out on the basket, he was unstoppable, and the Spurs led 97-90 heading into the final quarter. The strong play continued throughout the fourth, and the Spurs ended their losing streak a with statement win. I’m happy to say this ends a personal five-game losing streak for me when covering the Spurs, and I would like to thank you guys personally for continuing to believe in me. For the Blazers fan’s perspective, visit Blazers Edge. The Spurs are headed back on the road to take on the Utah Jazz on Tuesday. Tip-off will be at 8:00 PM CT on FSSW.